bleck why is there an egg?? I wanted this to be more like rice crispy treats. It was ye olden times. Everything had an egg in it. Maybe they made a creepy tinfoil bird to perch on top of said log. Glory, I apologize for your nightmare. I feel terrible. The book looks yummy, too. I think I missed reading that one. I need to go look for it. btw, I thought the tinfoil bird was wearing a voodoo mask. I love this! I think it sounds yummy actually! No apologies. I keep going back to look at it. It's like picking a scab. Can't... Look... Away... I'll make it my screensaver for a week and then I'll be over it! Perhaps, Emily, the surprise is that there's only one egg? 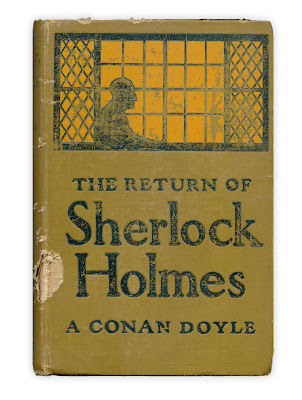 Yet another intriguing post, with added Holmes! 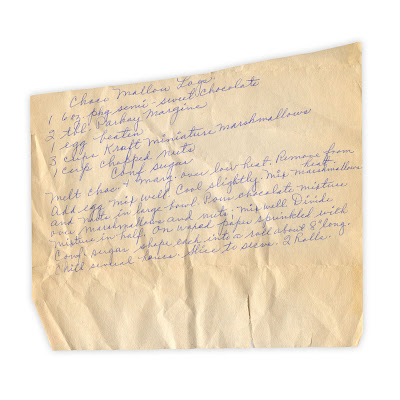 We make these at Christmas...my grandmother's old recipe. Ours doesn't have an egg and you roll them in coconut and nuts, freeze them and slice. The marshmallows need to be colored, that way they live up to their name of Stained Glass Windows!